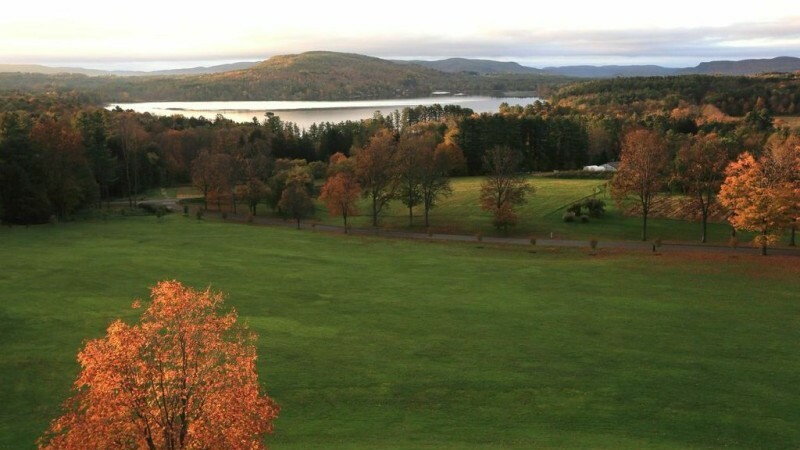 This Fall I’m living a dream, and I invite you to join the adventure to Kripalu. I’m offering and co-leading “Being Fully Alive” retreat at the famous Kripalu Center for Yoga & Health, Stockbridge, Massachusetts, October 12-16. I’m collaborating with a wise teacher/author, Cara Bradley, Founder, Verge Yoga Center, Wayne, Pa. and her soon to be published book On The Verge. We are thrilled to be offering this retreat together. – writing combined with meditation and yoga for self-reflection and joy. What brings you fully alive? What are your next steps? In the rolling hills and autumn leaves of Stockbridge, Massachusettes, Kripalu is one of the most special places I’ve found to rejuvenate and gain perspective. Plus, the food is marvelous. The retreat is open to all ages and stages of yoga experience. Read more about For Being Fully Alive: The Joy of Clarity, Strength, and Freedom, October 12-16, 2015, Kripalu, Center for Yoga & Health. Register on-line or click here for more information. I can’t wait to share this celebration of inspiration and purpose with you! I remember as a kid, getting out of a hot car, walking away from a parking lot and busy street into the Morris Arboretum; a gentler, softer world that smelled of honeysuckle, boxwoods, roses, and jasmine. The air was cooler and my feet wanted to run down the sweeping lawns. I studied the shadows under willows, the grace of geese and swans, and turtles across a pond. Nature was my sanctuary: a retreat to explore shadows, roll down hills, and imagine I was a princess, a lion, or a swan whisperer. As an adult, a retreat into nature taps the same child-like sanctuary of wonder and well-being. How many hours do I sit at a desk or inside? When will I have time to exercise? Where can I go to enjoy myself and rejuvenate? 1. Induce a soothing, meditative mindset. In a Yoga practice, this is called Pratyahara. We withdraw from our busy habitual behaviors and mainstream outer listening and attention to inner listening and attention. We restore our respect for our needs. Accompanied by a tall tree, a gentle breeze or bird song, we return home to our skin, the present moment, and the restorative beauty of silence. 2. Slow down, relax, restore and rejuvenate the body. The constant flux and changes of nature give us a wise backdrop and context to enjoy the body. The body seeks harmony, fluidity, flexibility, and balance just like nature. Gentle, mindful yoga, reintroduces us to the flux, flow and wisdom of our well-being. How is your body changing? How is your life changing? What does your body most need? A therapeutic and prevention-oriented approach to movement and yoga enhances well-being. 3. Disconnect from the addiction of stress, technology, and busyness. We let go the addictive reliance on email, cell phones, and technology, in exchange for a pure sky, a sunset, and a canopy of elms. A hawk flies overhead, a bunny darts behind the holly branches and the light sparkles over our face. We unplug, run down a hill and return to our senses. 4. Enjoy the flow of nature. Emerson wrote, “A nobler want of man is served by nature, namely, the love of Beauty.” Our eyes adjust to the subtle color, line, shadow, and textures. The wind in willows and our slow, steady breath. Even with the daily pressures of life, we can make time to enjoy our bodies, our minds and the glow of the sunset with others. 5. The fun of self-reflection and self-awareness. Natural meditative environments draw our minds and hearts towards an acceptance of what is. Whether by meditation, meeting new people, conversation with others, journaling or walking, nature can be an immense catalyst for personal happiness, creativity, wholeness, and embracing change. At the core of our mental, physical and emotional wellness Mother Nature’s meditative beauty restores our sanity and preserves our sense of wonder and ease. Will you slow down to enjoy your health? Will you take preventative care of your body and mind? The answer needs to be: Yes. We are creating a mindful culture that supports true well-being. We can support one another in a deliberate practice of reconnecting to our senses under the pure blue sky. Let’s get outside and enjoy ourselves. Join me this summer at the Willows, Morris Arboretum and Kripalu this Fall. A beauty calls to us; a wholeness we know provides a haven and home in our skin. You now. You making peace with the demons, the sadness, the loss, the terror, the joy, the happiness, the love, the kids, the back pain, the gray roots, the car troubles, the anxiety that you might not be enough, the “To Do” list, and pending stuff ahead. We are born into this world with the dance in our step and the song in our ear and heart, yet we may first come to know it by its disappearance or absence. We can feel a deep longing, like a lost child, and know that something essential is missing. We can walk on and persist in knowing the practice and process of our true nature, asks questions, is curious, courageous and bold. Our true nature is a process, not a cooked up PR response, not a boiled lobster red hot in the pot. Our true nature is stone soup. It’s a work of art. It’s part leftovers, part new. It’s doing so right now. It’s happening right now. One moment to say: Today is a work of art. No matter if it looks like a Jackson Pollack or Monet. It’s your own. It’s your process. I’m of the opinion that a woman’s life is an extended sway of managing her brilliant mind, hips, hormones and body through the detours of creating a love story with her life. She must insist on knowing all parts of herself, and enjoy herself on her terms. Yes, my heart broke, and it’s now open. It may hurt like hell, but it’s open. She must tell the truth to her doctor, therapist, friend, lover, journal, a tree, cat, dog or bird. She must insist on her beauty and walk on. My high school motto: Behold I Set Before Thee An Open Door. My friend and yoga student, Jen Torpie, took this gorgeous picture. 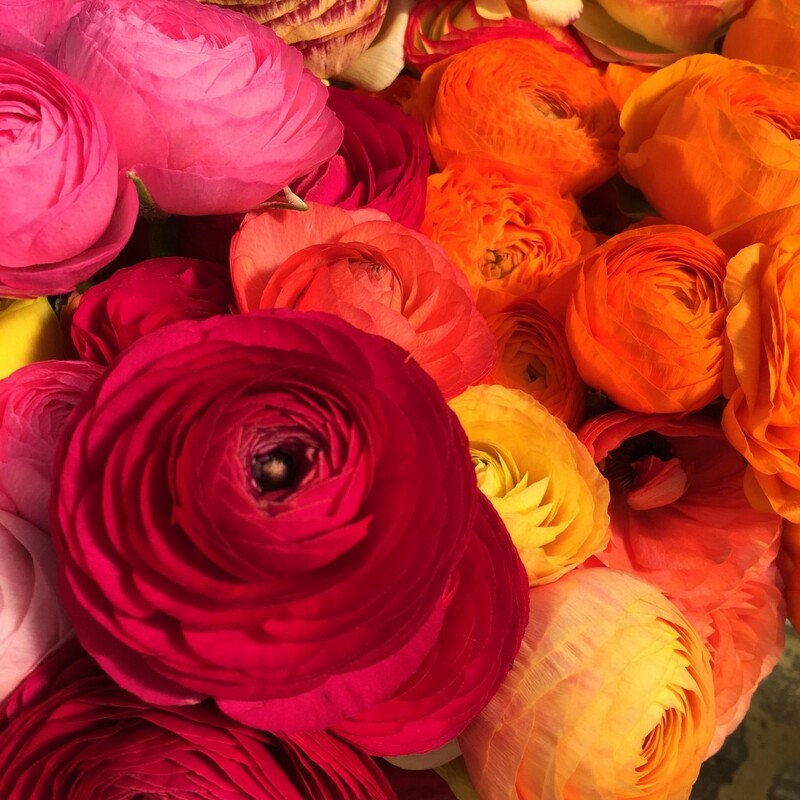 the bloom in our souls and the beauty of reds with yellows and pinks. Happy Monday and may we all have a week of compassion, peace and blossoms. Solo for the first time in 10 days, I sit doing a jig on the wooden bench, waiting for my tacos. Hail to the trumpets, accordions, and washboard beat. 1. Being outside feel like happiness. The Radiant Retreat and summer yoga are mostly outdoors. Sunshine. Birds. The wind. All part of the rejuvenation and fun. Thank you, sun. 2. Mindfulness does not mean humorless. Go your pace. Sway, bend, flex, dance, wiggle, and stretch and dance to “Wild Thing” if need be. There’s a sidebar of fresh salsa, cilantro, grilled cactus, and green hot sauce; daring myself to try the hot stuff, I think: Try something new! 4. Every seat is unique. Each bench is handmade, like each body – unique. The bench-legs are all thin tree limbs, organically uneven, no perfect lines. In yoga we deliberately work with what we have. The process is all. 5. The waiter (like a great yoga teacher) knows his craft and smiles a lot. The waiter is Mayan, wears a bright orange shirt, welcomes with a huge warm grin and says, “Hola!” By the way he’s pours tequila, and tops it with a lime wedge, I can tell he’s proud and passionate about his work. Find a leader or teacher who’s passionate and excellent about serving your body and mind the soul food it needs. 6. Each Tree (as in Tree Pose) is a funky, craggy, masterpiece. Palm fronds spread like starbursts, and plate-size mangroves fan in the breeze. Tree pose is one of the essential poses to build balance (before and after a margarita). 7. A tin wash bucket full of fresh green coconuts and a machete rests on the driftwood stump-cutting board. Green husk and white coconut chips are scattered beneath the stump in the sand. After a retreat (and yoga); parts of the unneeded shell around our mind and body falls away, and the juice (life force) remains. Moving the body and opening the mind on a weekly basis is a deliberate practice of feeling human. 8. Mockingbirds (Crow Pose style) hop and flutter from limb to limb. Their knees bend backward, wrists and claws grip and adjust. Tail a flutter. Not exactly like practicing crow pose but watching birds and pelicans help study balance. What creates flexibility and balance for your body? What creates flexibility and balance for your mind? 9. The atmosphere is part of the process and enchantment. Gourd lanterns with flower, hearts and stars hang above the tables. Small tin buckets over naked bulbs and votive candles in Kerr’s jars flicker light. Enough light for the giddy coconut-whacking waiter to hack open two coconuts, stick straws in the center and proudly serve them to the family with the baby dancing in his diaper. 10. Another slow swig of a beer. Have you ever noticed that taking a sip of beer involves a back bend, a lift from the core and hips? Gold-rimmed sombreros hang on the trunks of surrounding trees. The non-Dogmatic works. No absolutes. I sing Ole! at the end of the song and squint at the Kerr’s jar. It says: “Self-Sealing”. Like Self-Healing. Self-Soothing. Self-Caring. Self-Enjoying. 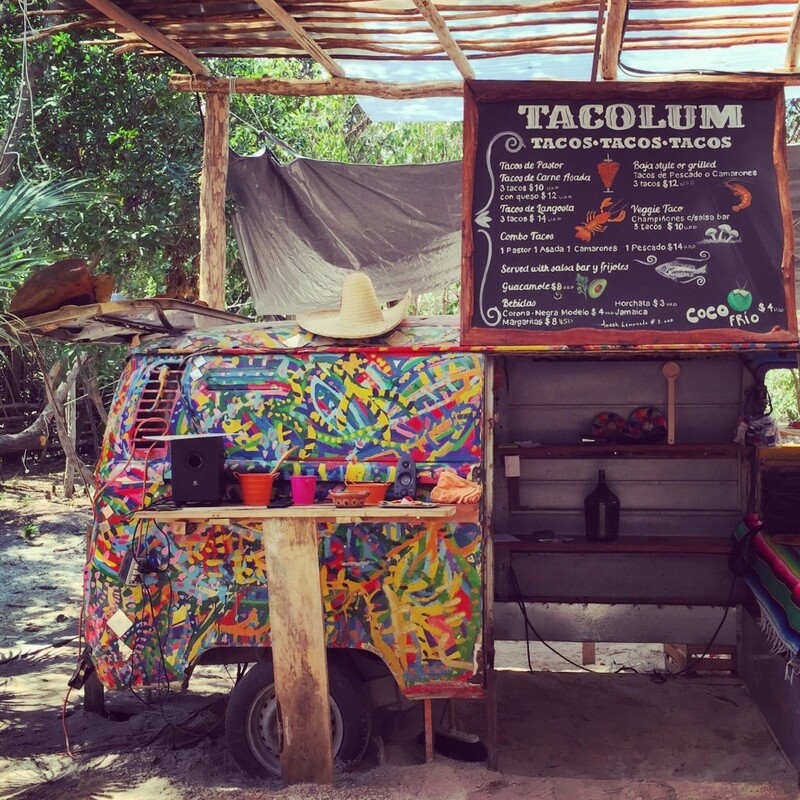 I ask myself, What will I self-seal from the Radiant Retreat 2015 and Tulum? I seal in the goodness. Do you have a place and time to seal in the goodness and rejuvenate? 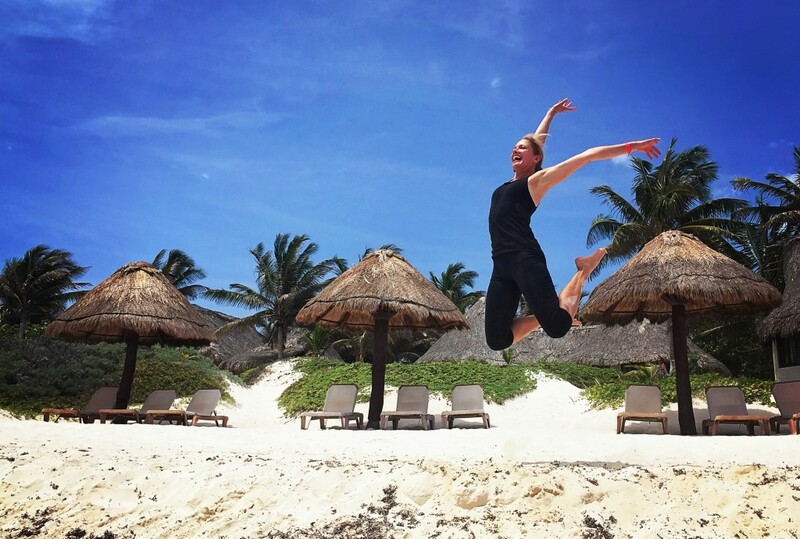 Join me for the 10th Anniversary – Radiant Retreat March 19-26, 2016. PS. Thank you to Jen Torpie for this dreamy photograph.